37mm 18K white gold case, fixed bezel with set with round-cut diamonds, white mother of pearl dial with silvered blue counters, Arabic numerals, luminous diamond shaped black hands, quartz Cartier calibre 7101 movement with chronograph function, semi-articulated white rubber strap with 18K gold double deployant buckle. Water resistant to 100 meters. 37mm 18K pink gold case, fixed bezel with set with round-cut diamonds, white mother of pearl dial with silvered blue counters, Arabic numerals, luminous diamond shaped black hands, quartz Cartier calibre 7101 movement with chronograph function, semi-articulated white rubber strap with 18K gold double deployant buckle. Water resistant to 100 meters. 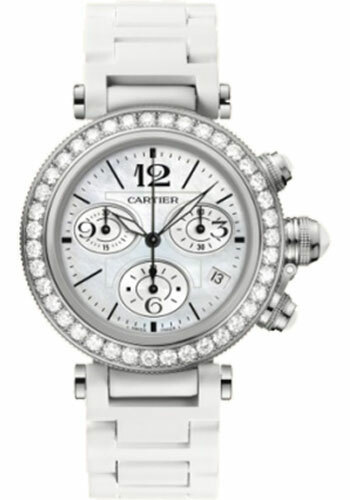 37mm 18K white gold case, fixed bezel with set with round-cut diamonds, white mother of pearl dial with silvered blue counters, Arabic numerals, luminous diamond shaped black hands, quartz Cartier calibre 7101 movement with chronograph function, 18K white gold bracelet. Water resistant to 100 meters. 37mm 18K yellow gold case, fixed bezel with set with round-cut diamonds, white mother of pearl dial with silvered blue counters, Arabic numerals, luminous diamond shaped black hands, quartz Cartier calibre 7101 movement with chronograph function, 18K yellow gold bracelet. Water resistant to 100 meters. 37mm 18K yellow gold case, fixed bezel with set with round-cut diamonds, white mother of pearl dial with silvered blue counters, Arabic numerals, luminous diamond shaped black hands, quartz Cartier calibre 7101 movement with chronograph function, semi-articulated white rubber strap with 18K gold double deployant buckle. Water resistant to 100 meters.